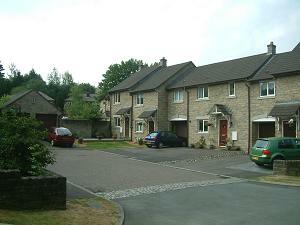 This 1990s cul de sac development replaced a large and very unsightly warehouse with terraces of modern stone finished cottages, a semi-detached pair and a detached house. The location is alongside Oak Bank mill pond and the Harrop brook, sometimes called Sowcar brook (pronounced soo-ca, hard c, short a). Approach off Ingersley Road. Foxglove Close is also off Ingersley Road. There is no interconnection between the two roads. Nearest pubs – Cotton Tree, The Turners, Church House, Poacher’s Inn. A substantial wall separates the estate from the stream and the mill pond, providing protection against flooding. However, the houses at the furthest end of Willowbank Drive and those on the right of Foxglove (pictured) themselves provide the flood protection at the up-stream end, with the stream running down the field behind these houses.